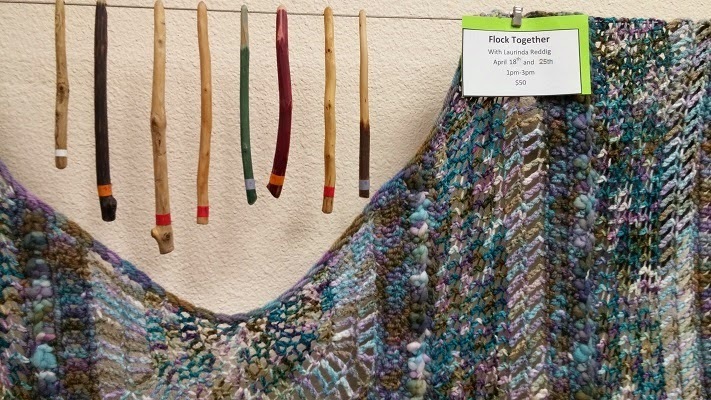 ReCrochetions: Flock Together Shawl - New Class at Blizzard! 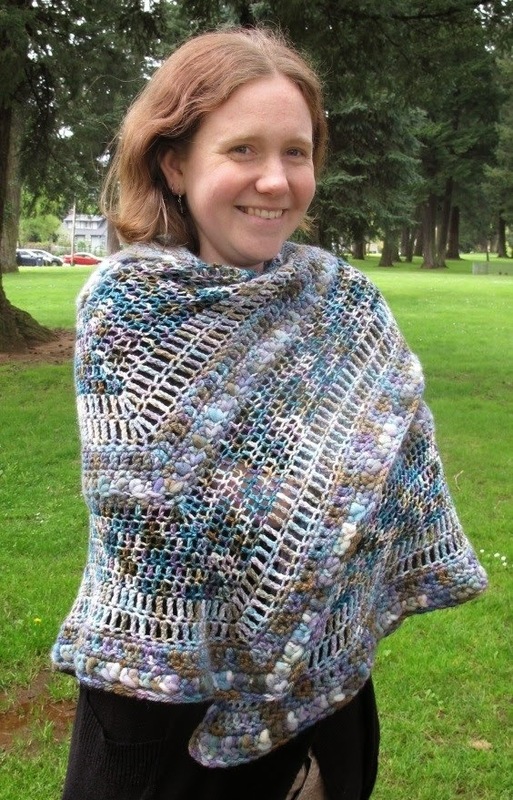 Flock Together Shawl - New Class at Blizzard! Next Saturday, we will be starting a brand new class at Blizzard Yarn and Fiber, in Vancouver, WA. 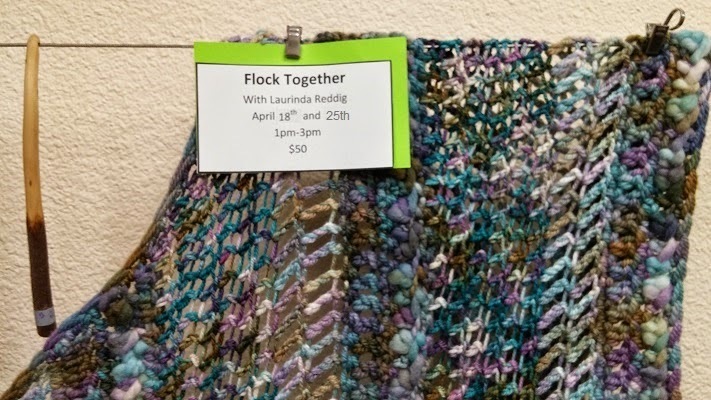 This shawl was specially designed to work with the Birds of a Feather yarn from local dyer Alexandra's Crafts, which features 5 different weights and fibers of yarn that have been all dyed together, so they naturally coordinate. Irina at Blizzard has ordered a variety of colorways to choose from in this fun, unusual Art Yarn. 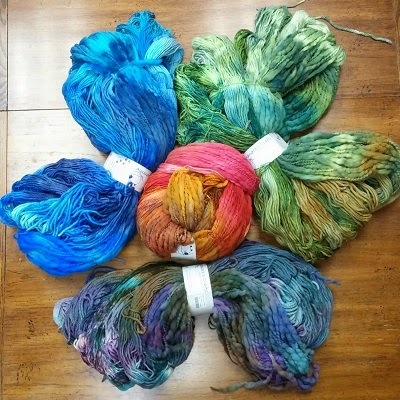 Each hank includes partial skeins of 2 worsted weight yarns, 2 chunky/bulky weight yarns, and a full 400 yard skein of sport weight, to equal 700-900 yards of gorgeous color-coordinated yarns. Check out some of the Craftwich Creations Hooks now sold at Blizzard! 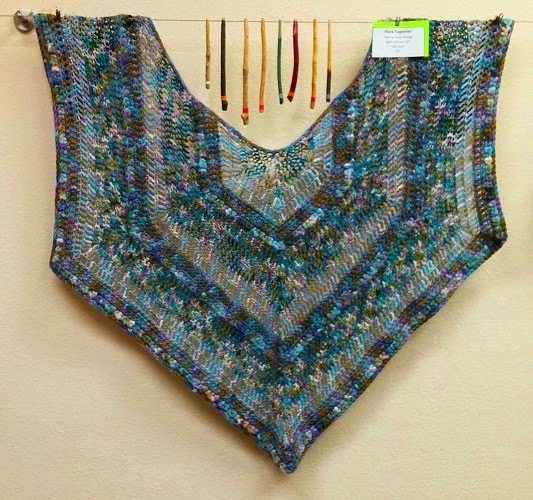 I first saw Birds of a Feather when I met Alexandra at Pearl Fiber Arts during the Rose City Yarn Crawl a few years ago. I was intrigued by this collection of various yarns, and the challenge of developing a design that would work within a kit like this. I picked up my first hank of 'Birds' at Oregon Flock and Fiber the following year, and developed the Flock Together Shawl design last year. However, the shawl pattern will not be available for purchase until AFTER the class at Blizzard. So, you have to sign up for the class to be the first to get it! My goal was to design a shawl that used basic crochet stitches and increases with the same size crochet hook throughout. Because each kit includes a somewhat different quantity of yarn, there are tips for making adjustments if you begin to run out of one type of yarn before completing the pattern. The result is a large, cozy, five-pointed shawl with solid stripes of the thicker yarns alternated with almost lacy sections of the finer weight yarns. Call Blizzard to sign up for this awesome class today! That is a gorgeous shawl! I would love to make one. Not sure I could take the class, but if I could, I definitely would.